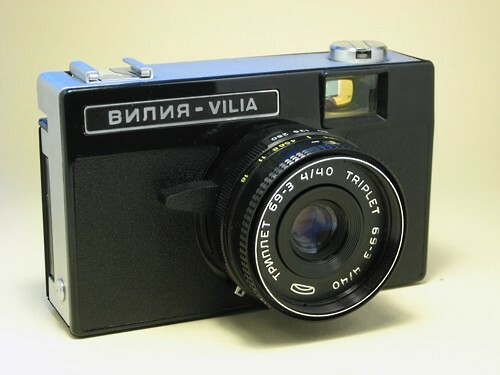 Vilia (Вилия in Russian) compact camera was produced by the Soviet company BelOMO of Minsk in Soviet Belorussia from 1973 to 1986; some 2 to 3 millions were made. Vilia is an elegant simple viewfinder camera, looking a little bit like an improved Smena Symbol, but is in fact a completely independend design. The camera uses standard 35mm film and is equipped with a 40 mm f/4 coated glass triplet lens. Shutter speeds from 1/30 to 1/250 s and B are set with a convenient ring on the lens body, while apertures from 4 to 16 with a tiny lever below the lens. Sadly, there’s no cable release socket. The shutter is of leaf type, while the four leaf diaphragm has a nearly square opening – both are located just behind the lens. The lens is focused manually from 0.8 m to infinity, while symbols on the distance scale help to assess correct distance for given subjects (portrait, group portrait, group, landscape). Film is advanced with a lever located on camera's back, coupled with shutter cocking. The camera is equipped with a hot shoe for synchronizing a flash, as well as with a synch cable socket. The excellent viewfinder has bright lines with parallax marks as well weather symbols connected with aperture setting (see below). 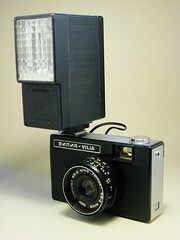 Vilia is equipped with symbolic system of exposure setting, similar in its idea to that used by Smena 8M or Smena Symbol. When the system is used, the shutter speed is preset according to film speed scale on its ring – from 1/30 s for 25 or 32 GOST/ASA to 1/250 s for 200 or 250 GOST/ASA, while the exposure is adjusted by changing the aperture from 4 (heavy clouds/rain) to 16 (bright sun). Weather symbols are visible at the bottom of the viewfinder only and are pointed by a small bright dot, depending of aperture setting. A further developments of the Vilia, using the same body and lens, were the Vilia-Auto, this time equipped with automatic exposure setting based on a selenium meter, as well as Orion EE and Siluet Elektro with a CdS meter. Angle of view: 57 deg.